You can essentially use any mixture of vegetables you want, but the combined flavor and texture of grilled mushrooms and artichokes is fantastic. Sauté onions in 1 Tbsp. of oil in a cast iron skillet on medium-high heat. Add mushrooms and cook until browned, 5 to 7 minutes, tossing occasionally. Remove mushrooms and onions, set aside. Sear chicken in 1 Tbsp. of oil in the skillet until browned on one side, about 4 minutes. Flip the chicken and sear it for an additional 3 minutes. Deglaze the skillet with the wine and broth; cover and simmer 8 to 10 minutes. In a small bowl, combine sugar, honey, white wine vinegar and remaining caramelized onion oil; set aside. In a separate bowl combine butter and flour. Transfer the chicken to a cutting board and cover to keep warm. Bring the wine mixture to a simmer on high heat. Whisk in the honey-vinegar mixture and 1 Tbsp. of the flour-butter mixture. Cook until thickened, about 3 minutes. Add reserved mushroom mixture, artichokes, basil, dried tarragon, and salt and pepper to taste. 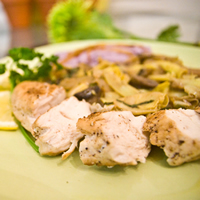 To serve, slice chicken and arrange on plates with mashed potatoes and ragu.